A Daily Dose of Fit: Don't get hurt doing kettlebells! I won't take the time to reiterate the benefits associated with regular exercise. You know them. And even if you don't, you know that benefits exist. It's common knowledge. But the unspoken truth is that exercise can be dangerous if you don't do it right. That's not meant to scare you, but it is meant to generate awareness. There's a rhyme, there's a reason to everything. Even exercise. Let's talk about how to avoid injury. Let's talk about kettlebells specifically. I teach a 30-minute class once a week. It's one of my favorites, but it's also one of the hardest to teach in my humble opinion. Why? Because there is so much room for things to go wrong. Any time you introduce momentum into a workout, it challenges your ability to stay in control. Of course, when you lose control, your body is put under a type of stress that can lead to injury. I do my best to shout instructions as we go, but sometimes out of the corner of my eye, I see cringe worthy actions. It happens. I help and we move on. Let's not move on for a second, though. Let's take a look at five ways you can avoid injury doing kettlebell exercises. This might be easier said than done. It might be too generic of a statement. But seriously, you have to know exactly what you're doing at all times. Don't just swing the kettlebell. Focus on why and how you're swinging it. Really dive into the action by taking control of every muscle involved. Oh, and your mind—don't let it wander. 2) Be mindful of your center of gravity. Gravity pulls you down. Stand still on your own two feet and you'll find a way to fight that pull—this is your center of gravity. But once you start moving away from this spot, once you start challenging yourself by swinging that kettlebell or stepping from side to side, that's when things get interesting. It's when your muscles, specifically your core, must work in a way that balances the shift in your center of gravity. So, no matter what you're doing, be mindful of your efforts to balance. If lack of balance takes over, who knows what way your body will fall and/or move. And/or get hurt. 3) Keep a neutral spine. 4) Find power from your hips and legs, not just your arms. When we hunch, lean and bend, we are attempting to generate power from the back/spine. But there's a better, more efficient way to do it—use your hips and legs. They're extremely strong and efficient. Sure, you can use your arms, too. But you really need to focus on the big picture. On using as many muscles as possible to perform whatever task is at hand. Kettlebell swings are not achieved through the arms. Rather, they're created by the force generated by your hips (and glutes and hamstrings) as you push them forward when you swing the bell upwards. Failure to use this method, or to rely to heavily on your arms can lead to injury and/or overworked muscles. 5) Pick the right bell. Like any exercise, it's crucial that you lift a weight that's right for you. Lifting too much taxes the muscles being challenged. And if you tax those muscles too much, well...you know. 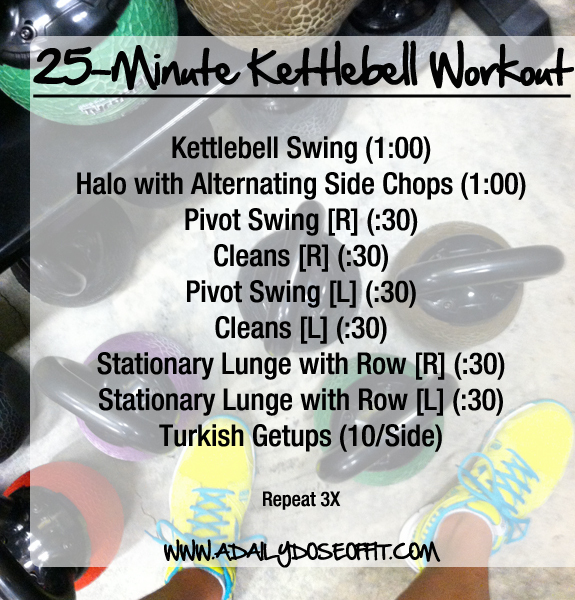 Now, because I know you're all super pumped to get out there and swing some bells, I give you the following 25-minute kettlebell workout. Please be sure to warm up first, and don't forget to cool down and stretch when you're done. Question: Can you recall a time when you hurt yourself working out? What could you have done differently to avoid injury? Let's learn from each other!